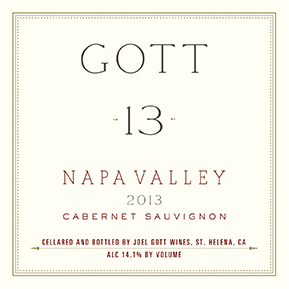 Fruit for the Joel Gott 2013 Napa Valley Cabernet Sauvignon was sourced from vineyards in the Howell Mountain and St. Helena appellations, as well as from hillside vineyards in southern Napa. Fruit from Howell Mountain adds power and structure to the wine, while fruit from the valley floor in St. Helena retains its purity. Fruit from southern Napa provides depth and intensity, because of the cooler weather and challenging, rocky soil. Blending fruit from these three regions gives the Gott 13 its complexity. The 2013 growing season experienced moderate temperatures throughout with a string of heatwaves in the months of September and October, resulting in fruit with ideal ripeness, deep color, great structure and incredible concentration. After fermentation, the wine was aged in 70% new Bordeaux French oak and 1-year-old Bordeaux French oak for 20 months.